UPDATE: If you are a current subscriber you can buy this box for $49.99 in the shop section, and you’ll get to pick out all 4 choice items, too! This box was sent to us for review purposes. #FabFitFunPartner (Check out the review process post to learn more about how we review boxes). Check out all of my FabFitFun Box reviews and the Women’s Subscription Box Directory! With this Editor’s Box, you actually get to pick some of your items, so I’ll show you all options in this review. Now, time for the items! First, I’ll show you the choice items. Then the items everyone will receive. This clutch measures 10.25″ across, 6.5″ tall when folded and 11.75″ tall when unfolded. The teal side is made of vegan leather and the print is canvas. It’s lined with polyester and is lead-free, and there is a pocket inside. 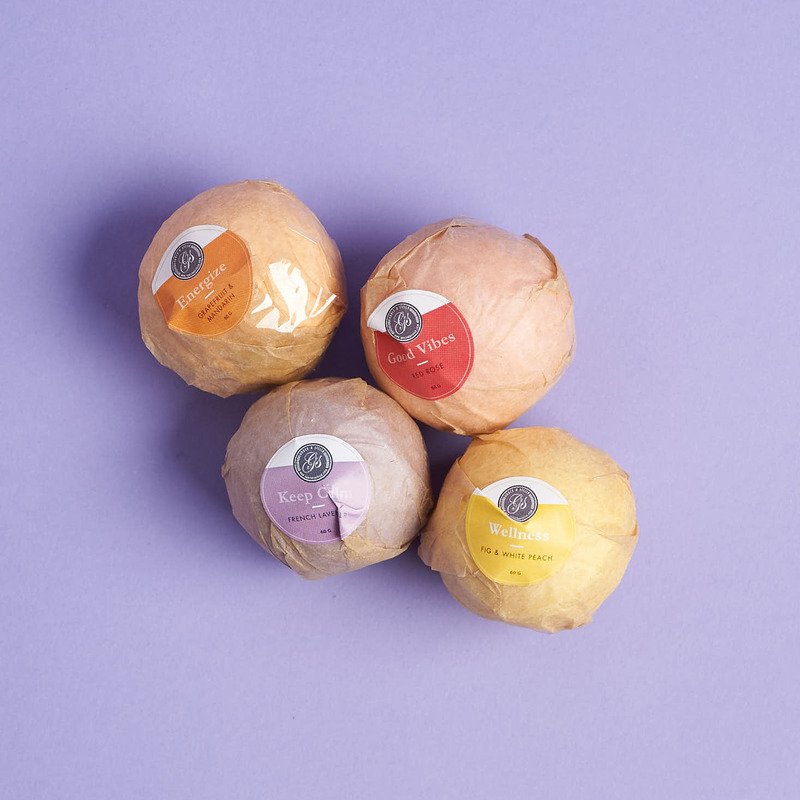 These bath bombs are individually wrapped and ingredient-conscious. They smell fab, too! It’s freezable and microwavable, so it works for both heat and cold therapy. This is one of my favorite subscription box beauty discoveries! I love these hair wrap towels! I first tried one thanks to the Summer Box of Style, and they are great! To use it, you put it on your head, then wrap up the bottom part to hook onto the button at the top. It’s a soft and absorbent fabric (100% Polyester) that is designed to help your hair dry faster. Obviously, you can’t go wrong with tarte, but if you signed up as an annual subscriber and are debating which tarte set to go for – I’d say go for the palette. For starters, it is super cute! But more importantly, the colors are stunning. Excellent pigment, a great mix of matte and shimmer shades, easy to blend, and very little fallout. The formula is really lightweight, dries quickly, and it is mostly smudge proof immediately. It has a matte finish, and the pigment is fab, too. This is a pale rosy shade with good pigment and a glossy finish.The formula is moisturizing and non-sticky, too. The color is a little more light than I usually go, but this is great for a no-makeup look. This mask is free of parabens, sulfates, and phthalates – and it is safe for color treated hair! There are two ways to use this mask – let it sit on your hair for 5-10 minutes after massaging it into your roots, then rinse out. Or for deeper hydration, cover your hair with a plastic shower cap and sit under a dryer, applying direct heat for 30 minutes, then rinse. I tried the 5-10 minute version, and I could definitely feel a difference in the softness of my hair after using it. This cute mug is 15 oz and microwave and dishwasher safe! And “I’d rather be in bed,” really speaks to me! Verdict: I think this is the best Editor’s Box I’ve ever seen. I love how many choices you get, too! Depending on what you pick, the value is anywhere from $276-$295. With the MSA10 coupon, you can get this box for $39.99 or just under $5 an item! What do you think of the latest Editor’s FabFitFun box? They are different and the biggest way you can tell is by price! I’m not sure if you used a coupon or not so I’m gonna give you the full prices, if you got a seasonal box subscription you will be paying 49.99 every 3 months and if you purchased the annual subscription you will be paying 179.99 a year. And YES ordering the editors box DOES enroll u in the subscription. The editors box is an introduction box that’s offered in between seasonal boxes. This will start a seasonal subscription. Hope this helps! You will LOVE FFF! I do! I just signed up for FFF myself on Saturday. I’m (im)patiently 😂 awaiting for my editors box to be shipped. And also for my turn as a seasonal subscriber to the add ons! I’ve already discovered how great the FFF community is! I’ve only rec’d 2 psmh boxes (my first was their last monthly box and then my most recent box-the first quarterly box). I’m canceling my psmh sub once I receive this current box and will probably subscribe annually to FFF. I feel like FFF is a much better fit for me and I’m very excited! Awesome! You’ll love fff I know I do! Does anyone know why the coupon code ASAP isn’t working? I saw on My Subscription Addiction it was good til May 6 and was posted 6 days ago…? I just used it today. Maybe try again? I just got this box in the mail and I just have to say, the lip products were a huge disappointment. The shade did not look at all like the swatch here on me IRL. The shade actually matches my skin tone almost exactly, and it looks like I am wearing foundation on my lips. My skin tone is medium with yellow undertones, so just FYI, for others like me. I think these would work better for people with significantly darker skin tones than me. I am hoping this box sells out quick. I love FabFitFun! I am an annual member and this box is temping me. It is everything I don’t need and everything I want. BTW, for those who order this and renew the sub at the same time…you do get charged the $100. Yikes. This is the 3rd editors box I’ve gotten and every single one they wait the full 10 days to ship. I ordered 10 days ago and no shipping yet. I just find it annoying. Anywhere else that you shop online wouldn’t wait a full 10 days to ship items that you have paid for! Ok rant over! I had the same problem with quarterly box shipping, they wait a full ten business days before “shipping” except that instead of shipping it sits with label created. Got shipping notice today. ETA Friday the 13th! Lol Go figure. I guess I got lucky then…ordered on april 28, shipped may 1! I finally bit or rather I couldn’t stop myself anymore. I chose the blue tote/eye shadow palette/body buffer/hot & cold pack. So excited! Thank you for the wonderfully detailed review, Liz! Does anyone happen to know when this box will ship? I am hoping soon! I l am an annual member but usually the editor’s boxes as well! I am running out of my Exfoliate Kate which I love and makes my skin feel and look so Good! I love anything Tarte So I’m excited! My dog got a hold of my Free People eye mask and busted the cooling insert inside! This eye mask has helped me with headaches and definitely sleeping! I am like a little kid on Christmas everyone I get my box so I am hoping it comes soon😀 I ordered it as soon as the editor’s box was available and received an email I would get another one when it’s ready which takes 10 days..I am pretty sure it was the 25th or 26th so I am hoping I will get my email soon with the tracking #..Hope this helps! My email is long and I know Gone with the Wind has already been written..Lol..Thank you fabfitfun for always helping me and answering my questions! You are the best! I have not seen this pallet ever in my 6 seasons, not even in the add ons. Was thinking it came in some other subscription box, though. A Tarte palette cam in a past Boxycharm, but it was different than this one. I must be thinking of that. Thanks!
! I really liked the Spring Box but I have a feeling I am going to LOVE this box!! *I chose the eyeshadow ,black and white bag,hair wrap & bath bombs! Can’t wait! It’s such a great box! Hope you love it! I bought 2! One that I had no choices and the other I bought from the shop with what I wanted. I hope I don’t get too many duplicates but for the price I had to. Mabye I’ll save some for Xmas gifts! I had to get 2 so I could get all the variations I want! I want that Tarte palette! If anyone wants to swap theirs, please hit me up!!! Are you still interested in swapping the tarte palette?! I’m an annual subscriber and want to buy the box, but the MSA10 code doesn’t work. What am I missing? The code is for new subscriptions. I basically just ordered this for the ExfoliKate! It’s soooo good! I am so much more excited about this than I was for the spring box. I went with the black tote, eyeshadow, towel, and bath bombs for my selections. I like this box way more than the spring edition. I picked the eyeshadow palette, bath bombs, hair towel and an orange (hopefully) clutch. Me too! I love this box the spring box was MEH! Summer box is my last one and I’m going to cancel and wait for the VIP boxes to come out. This box is an amazing value! Was about to reorder exfolikate and spongelle, so everything else is icing on the cake. Love the tote, bath bombs, mug…the only thing I could truly live the rest of my life without is another boriego hair product. Thrilled with this! I think this is the best box ever! Of course, having said that I don’t need any of it lol. I was so panicked like in the capsule sale that it would disappear I didn’t think through my choices. I love 3 out 4. But I’m so excited for this box! I caved and resubscribed to get this box (bought in the shop). I think for the first time ever I will actually use everything, thanks to being able to choose!!! Liz, If I reactivate it is saying I will receive the summer box, not this editors box. Did this happen to anyone else? Is it sold out? I noticed that last night when I was checking to see if I reactivated one of my accounts I could get the editors box. It seems like you have to be either a brand new subscriber (and then you get 2 out of the 4 choices unless you upgrade to annual) or you have to be a current subscriber and buy it for $50 from the shop (and you get all 4 choices). You could try to reactivate your account, sign up for summer and then buy this box from the online shop maybe too. But I’d verify with CS first. Thanks, I think that is what I will do! I caved too!! Blue tote, bath bombs, palette, Spongelle. I just couldn’t resist especially since we got to pick so many items! Agreed, I resubscribed to get this. Seems like a great box!! Bethany we are box twins! Those were my choices too! Love it. Love it Dani! I’m soooo excited for this box!!! I used to use the hair wraps but for Christmas I got the devacurl towel. You can find it on the Sephora website….. it dries my hair so fast!! (Thick and curly). I love it so much I haven’t gone back to a wrap. If they made it in one though, it would be even better! If I had complete customization I wouldn’t hesitate, but I really have enough eyeshadow to last me a lifetime (and then some) and I don’t need a hair towel unless this is a totally life-changing towel. I wish I had somebody to box split this with. I have two clutches. I can’t remember the color names. I just know for sure I don’t have the mint one. I would be willing to scale or swap with you. Thank you for the offer! The mint one is my favorite, but maybe we can work something out for one of the others? I’m on the swap site, but have never swapped (don’t have much to swap), so if you would like to or if you’d prefer to swap/sell to someone else that okay too! I also saw that you bought one, but if you’d like some duplicates of the stuff other than the clutch (and maybe one or two others) I could purchase it (new subscriber discount) and we could split! Hmm I wonder why my first post didn’t go through! I don’t have the mint one but if you would still like to swap you can email me at coopermargiem I’m at Gmail. How do I find you on the swap site? Like I mentioned I’m new and have no idea how to do this? Hi Margie! Sorry I haven’t replied, I’ve been busy. I’m not really sure, I’ve never swapped before either, but I think I decided to buy a box…I think! So I may not need a clutch. Thank you so much for the offer though and if I get one and decide I need another I will totally try to find you on the swap site! Hi Bee, I’m glad you decided to get a box. I think it’s a nice assortment. Lol, we are like the blind leading the blind with this swap thing, right? Anyway, take care. I got the bathbombs, the eye shadow, the beach tote and of course the spongelle. Question, are these being shipped out quickly or do we have to wait the 10 days? Pro swap tip. Find someone with several hundred swaps. Chances are you land on someone really nice who will answer your questions and walk you through your first one. That’s what happened to me and I was so lost otherwise. Swappers range from very serious to laid back, shoot for the ones who’s profiles lean towards laid back. Thank you for the tip! I too just got off the waitlist and am so confused. usually it’s insured up to $50 automatically, so make sure you check on that. I honestly have never bought insurance and I’ve been lucky, 90 swaps. Also a lot of people seem to print their shipping labels through paypal or something and that seems to give them a discount, you need to be able to weigh it though. also look into reusing packaging that’s what I always do. Yes you paid waaay too much. If you use PayPal shipping you get a free tracking number and if it’s under 13 oz use first class shipping which is never more than $4. For a small eyeshadow you would pay about $2.50. Plus I try to swap over $20 RV to make it more worth the shipping. Hope this helps! I swapped like crazy my first year but can’t seem to find anyone who wants to swap anymore. I didn’t know Paypal offered that service. I’ll check it out. The shipping page on the swaps should have a link. If u don’t use that, sign into PayPal and then type into the web address paypal.com/shipnow you will need a scale to know the weight. Lighter it is, the cheaper it is so I try to use bubble envelopes which you can get cheap at the dollar store or Walmart. Like I said I’ve stalled out on swaps so I’ll be selling all my stuff at a garage sale this next month. Thats why you’ll see some experienced swappers say multiswap only on some things. If you have some 300$ bracelet 10$ shipping is nothing. Like you said, tiny eyeshadow? Not worth it. You can put in your profile that you prefer multiswaps or a swap of over a certain RV only. Thats what I do. Most of my swaps are at least an RV of 100. I have been wanting an echo dot. There’s other things too. But Ivthought swapping for that item would be easy but, NOT! Just complicated. I’ve been off the waitlist for months and I have not even bothered to try. I have so much stuff I know that people want, but it just seems like a lot of work and the swap page is such a mess to sift through. Sounds great in theory, but it’s like a ridiculously large flea market or swap meet…only worse because you have to do all this other stuff(packing/driving/shipping) for each item. So happy to see the mint mug lol it’s the design I want but didn’t get the first time. Now just hoping for mint eye mask. I wasn’t even done scrolling through the review before I made up my mind that O wanted it. I was literally looking for the link to order it! What a great box! I was shopping for a tote and a sleep mask. And I always need bath bombs. Everything in this box will be very useful. Very excited to get my goods. This is an insane deal. They clearly have stock to get rid of and I am not mad at it. FFF is amazing at showing me things I would never otherwise know existed and then now cant live without. This will be my 4th gel mask, I now sleep with them every night. The ice pack is AWESOME. The mug I gifted for Christmas and my friend loved it and uses it daily. And Im not sure what a shower is now without a spongelle. And thats just the ones in this box. Lovelovelovelovelove. Wow! I picked up one from the shop with my four selections. It’s a 1/3 discount off the regular price for Exfolikate which I already love, plus I get tons of other stuff?! Yaaaaaaas please. Is the site having issues? Yes, we killed it. FFF is great at many things but they can NOT handle site volume. Took me about 20 minutes to get through. They have the best customer service. First my box took forever to ship so when I contacted them they gave me a $10 add on credit and shipped my box 2 day priority. The next day I noticed I got a refund for the living proof shampoo conditioner duo ( I was upset) I contacted them again and was told they ran out and they were so sorry. Well the next day my package arrived and guess whats in the box? Yep thats right….. the living proof duo but then i noticed i’m missing the nail ridge filler i contact them again and seriously like 2 days later it arrived in my mail. Like Wow what amazing customer service. They have a customer for life. Sorry for the long story but i just wanted to let everyone know they rock. Yesss! I totally agree! I sent an email asking if I resubscribed if I’d get this box and was told yes, only to find out I was charged for the summer box not this one… Chatted with an associate, she didn’t even ask questions! Switched my sub to the editors box and gave me choices!! So amazing every time I’ve had to contact them. Super quick responses too! Just a heads up – this is available in the shop now (even if you’re already a subscriber)! I’m pretty stoked for this. Great mix of gifts (bath bombs for my bonus daughter; eye mask for my cousin) and stuff for Christy: Beach tote!! How are you able to order the editors box? I thought this is only for new subscribers. It’s in the “shop” if you are a current subscriber. Why are the editor boxes better than the regular boxes (except last winters, that one was great). My husbands gonna be like…seriously you got another box? Wow, so many of my favorite items from past boxes all in one! (the hot/cold pack makes this box an instant win for me) Nothing I need so won’t be snapping up but a great box for new subscribers. This is tempting! I might have to resub. I just ordered the Editors Box!!!! I am so excited. I shouldn’t have, but I did. Got the 4 choices I wanted. That’ll be my (late) Easter basket!! Liz – Is it for new subscribers only? Yes, sorry for any confusion – the coupon and the Editor’s box are for new subscribers. Sold! I’m an annual subscriber, so this was awesome even without the discount! Thanks so much for letting us know. I can’t wait to receive it! I would have been thrilled with this box. My fabfitfun box contained 50% different items from this which I have given away or donated. Hi Liz, I am already an FFF seasonal (not annual) subscriber and was able to do all 4 customizations (of course that also means I didn’t get the $10 discount). So it seems the limitations on customization to just the first two is only on new seasonal subscribers. Thanks for letting us know! I just updated the top of the post with that info. Love that current subscribers can get this box, too. It’s SO good! It really is so good, I definitely don’t “need” another box right now 😉 but I could not pass this up!!! Liz I didn’t read all replies but the Blue and white Tote is is Blue and TAN a lot of members were very upset about this. They bought to match weekend. FFF is aware but it is huge mistake again. Hey JustMe I read your post and was like no way is it tan!! I had to go take a peek at it as I got the blue tote. It is a like cream color. I didn’t buy it to match anything and if it was Blue and white it would look too bright with the material it’s made out of. I think it’s s light cream/beige and I really like it!! I got this with the 4 bath bombs and 2 lippies. Counting those individually, that’s 12 items. At $50, that’s just over $4 an item. It’s an amazing deal and the only item I probably won’t use is the sleep mask (I love mine from the spring box, but I already have two). I’m thrilled to get more Exfolikate. It was an easy decision to snap that up! I’m a current subscriber and as others mentioned on the last post, this box is available in the shop now with all four selections. But for some reason it shows and lists the teal and yellow/orange clutches instead of teal and white. I got the tote though…not that I needed another box. Lol. That’s a great introduction box for fff, I’d be happy with it if just joining.